The expectations have been dialed down dramatically over the past few months for markets and the economy. If indeed it’s all detached from reality, as the fundamentals would suggest, how might markets look if we have another 3%+ year growth in the U.S. in 2019, and if the weight of the China trade dispute lifts, and emerging market growth rebounds? My guess: stocks and commodities will be much, much higher by year end. For stocks, Q4 earnings season kicks off next week with the banks. Given the deterioration in sentiment last quarter, the estimates on earnings have been dialed down. We’ve gone from a full year of earnings growth north of 20% (in 2018) to earnings growth expectations in 2019 at just 7%. That sets up for positive earnings surprises this year. And at 14 times next year’s earnings, the market is already dirt cheap — better earnings would make stocks even cheaper. 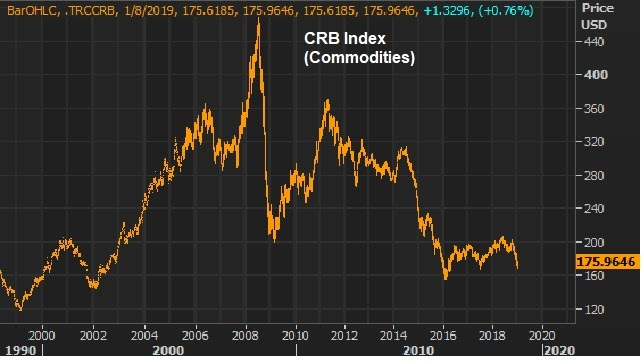 As for commodities, the economic expansion has been called “late cycle” by many, but commodities haven’t participated, as you can see in the chart below. What if this chart tells us that the decade that followed the financial crisis was indeed a depression, and central banks were only able to manufacture enough economic economic activity to buffer the pain (not a real economic expansion)? And now, instead of at the tail end of one of the longest economic expansions on record, we’re in the early stages of a real expansion, driven by fiscal policies and structural reform that has started in the U.S. and will be implemented abroad (Europe, Japan, China).